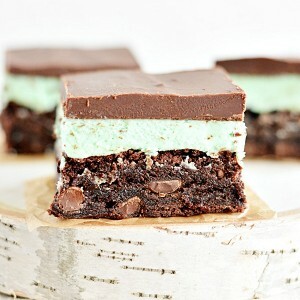 Triple Chocolate Mint Brownies with a mint cream filling and a ganache topping. Preheat oven to 325; line 8x11 inch baking dish with parchment paper. Combine brownie mix, egg, water, and oil. Bake 40-45 mins, or according to package directions. In a large bowl or stand mixer with the paddle attachment combine butter and cream cheese. Add whipping cream, mint extract, and food coloring. Slowly add powdered sugar until well combined. Spread over cooled brownies and refrigerate for 1 hour. In a small saucepan melt chocolate chips, whipping cream, and butter together. Pour over brownies, return to refrigerator for 1-2 hours or until chocolate has set.